You can not work alone when arranging a bake sale for, say, a new roof for the school’s library or a new playground for the orphanage. Gather a group of volunteers who can help out during the event. Organize them into groups that would take care of the security, the selling, the entertainment, and even the publicity. Get their contact numbers so that you can get in touch with them any time the need arises. Bake sales are usually held in places where a lot of people are bound to pass by. Church and school parking lots, park grounds, and even areas near commercial establishments are the perfect venues to draw in a crowd. Be sure to look for a place that is not only convenient for the sellers but also to the potential buyers, such as those that have adequate parking spaces. Don’t forget to ask the local government or any authority in charge of the venue for the permission to use the area on a given date. To prevent duplicating goods and items to be sold in the fair, ask your participants to draft a list that details the items that they will be providing. This ensures variety in the products that you will sell in the bake sale or event. If you think you need assistance in putting up an event, you can ask for sponsorship from local companies and establishments. In return for their help, you can offer them advertising and even a stall where they can sell their own goods. To ensure that your bake sale gets a sure audience, advertise to the neighborhood or area. Make announcements at churches or in schools, use posters, or even send emails and text messages. On the day itself, follow a detailed and orderly setup plan that would make the affair an easy and manageable event. If needed, have adequate security and even medical assistance ready. Greet incoming guests with a smile and bid them to sample your home-made treats. Cooking Tips – Cooking and Food-related ideas. Organizing Garage Sale – Organizing business ventures and other business-related ideas. Avoid Bankruptcy – On how to be financially stable. Minimizing credit – Tips on managing business for more income. Budget Savings – How to manage your financial needs. Garage Sale – All about selling and other money-generating ideas. Having a bake sale is such a fun activity which gathers people all together and at the same time raise money. This is usually can be set up at places where there are lots of people examples are a pedestrian traffic, a grocery store or busy intersection near the malls. The point of major sales for bake sale are homemade goods. Bake sale in other countries do have other names example is United Kingdom in which they called it “cake stall”. 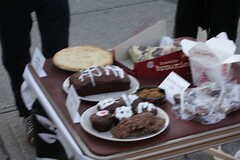 Items availavle for sale in bake stall are cake slices, pie slices, brownie squares, cookies, muffins, doughnuts and water. Organizing a bake sale involves several activities including conceptualization, development of fun filled programs, inviting group of loyal customers, attracting and development of prospective buyers, promos and incentives, grandiose opening ceremony together with the guest list. Events like bake sale provide businesses with an opportunity to expand its sales horizon and clientele by creating a widespread promotion on the items and the specialty a bakeshop has. A bake sale is an effective and efficient marketing tool for a starter business to be known in the market. A bake sale will ensure you of a higher sales than garage sale because of the simple fact that everyone loves food- especially pastries and cookies. The important thing to consider during a bake sale is knowing what the people in your neighborhood (or your consumers) want and how much they can afford. Also, if you know that people around have stricter budget, why not try to sell the products in smaller portions? In this way, people with lesser money can at least afford and you know yourself that your consumer population will be larger. Because people love to eat and are curious, a bake sale is a great way to earn money while having fun. It also builds entrepreneurship skills for both young and old. But, in order to be successful, it needs careful planning, strategic marketing and most important of all, you need to make sure to market your baked goods with a positive attitude. Be optimistic. It’s not always that everyone will buy your products, so be sure to put on your best smile and talk your way to your consumer’s heart (and stomach). It will be extremely helpful if you know someone who can bake really well to help you in your bake sale but in case you don’t, the tip is to add something extraordinary to your home-cooked goodies, may it be a special flavor or unique packaging. You can research on the internet or go to your library for tips in baking. Don’t be afraid to approach your family or your school cook on any suggestions for your bake sale. Don’t forget to build rapport and be cheerful in accommodating your customers to keep them coming back. Bake sales are really great ways to raise money, especially if you can come up with so many yummy treats for very little money. Searching the net for quick recipes for simple and easy to make baked goods is good way to start. Then when you have your volunteers (asking help from family and friends can make the experience even more fun) you can all sit down and each try a recipe found online. Just make one batch each and set up another meeting to try them out. You’ll then know what’s going to be on the menu, who’s assigned to do what and how much you’ll need for the bake sale. Then you can go on to find sponsors, the venue and have a great bake sale! We usually do bake sales at our school. I took up Hotel and Restaurant Management so having bake sales really helps in our baking and selling skills. Our baked goods include choco-chip cookies, brownies, cakes, pies, loaves, tarts and cakes. We sell it during school fairs and in city fairs. To make our stall popular, we give away fliers and free samples. That way, they will know what products we are selling and prove that we sell something tasty, too. If you are a newbie to baking and want to have a bake sale, you can attend baking classes that specializes in commercial baking. These classes will teach you the basics in baking, purchasing and pricing. Make sure that you control the quality of your products. In any case that something got stale, throw it away and never sell it, or else you will lose your customers.